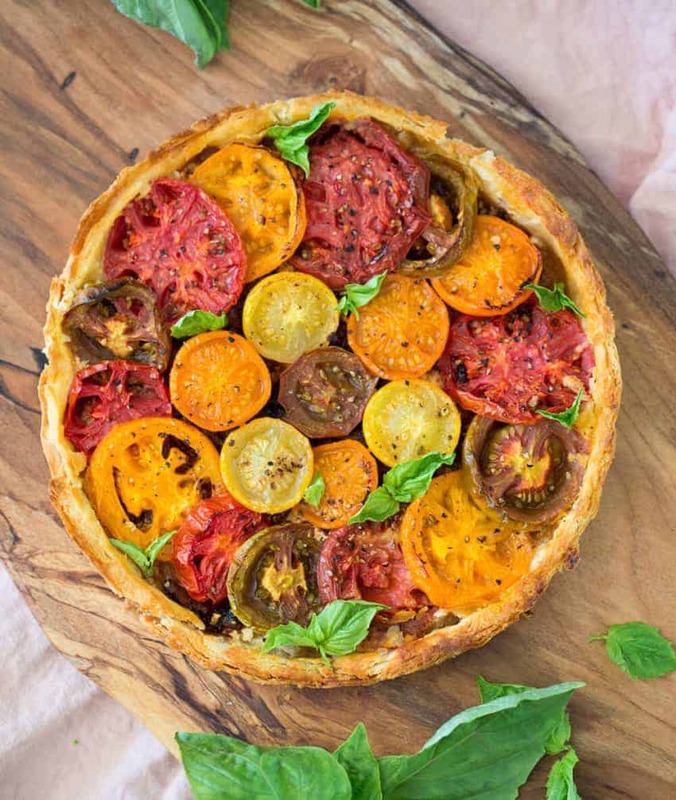 This delicious tart features a crispy pastry crust lines this savory tart filled with goat cheese, caramelized onions and sweet heirloom tomatoes. Cooking the tomatoes softens them and enhances their sweetness, which pairs wonderfully with the goat cheese and caramelized onions. If you haven’t made a savory tart lately (or ever) then it’s time to roll out that pastry dough and get to baking! 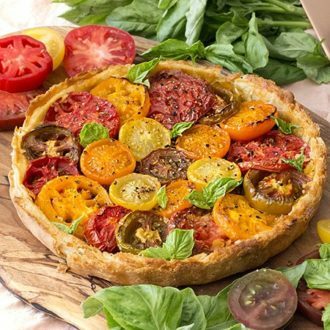 This tart has three main ingredients; beautiful heirloom tomatoes, caramelized onions and creamy goat cheese. If you’d like to add some more flavors use the spread from my spiral vegetable tart in place of the plain goat cheese I used here. I used strips of parchment paper to help me pull the tart out ofter baking. It worked like a charm!! After cutting the tomatoes try patting them with a paper towel to reduce the water content before tossing with the oil. Feel free to add your favorite flavors to this just like you would when making a pizza! I love some sautéed mushrooms and leeks in this dish too! Add a smattering of fresh basil leaves just before serving. If you want to go all out then chiffonade some basil and sprinkle it all over. 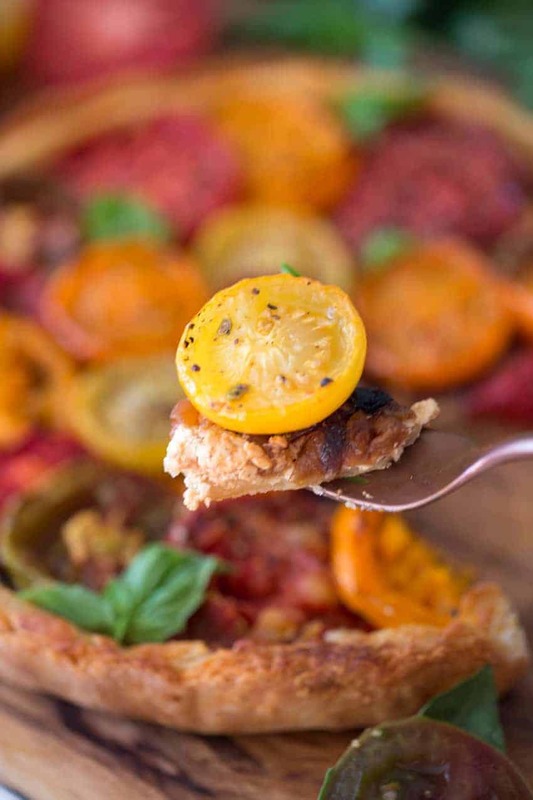 A crispy pastry crust lines this savory tart filled with goat cheese, caramelized onions and sweet heirloom tomatoes. Slice the onions and cook on medium-high heat with the butter stirring occasionally. Reduce the heat to medium or medium-low if the onions start to burn. Slow cooking breaks down the sugars in the onions and this takes a while (30-40 min). Slice the tomatoes. Cherry tomatoes can be halved. Larger tomatoes should be sliced into 1 inch pieces. Toss with 2 tablespoons olive oil, 1/4 tsp kosher salt and thyme if desired. Grate the butter into the flour mixing as you go. Add 2 tbs of the ice water (you can add more later if need be) and work the dough together for just a few moments more until it comes together. Add another 1/2 to 1 tbs ice water if it's too dry or crumbly. Separate, gently flatten the dough into a disk and cover in plastic wrap. Place in the fridge. and let the dough chill for at least 30 minutes. 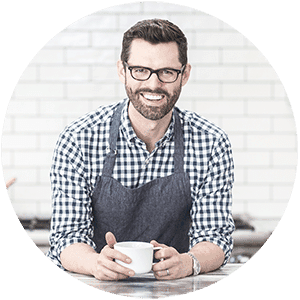 In a small bowl, lightly beat the egg with a teaspoon of water. Roll the dough out and press into a large tart pan. Spread the goat cheese on the base. Arrange the caramelized onions on top then cover with tomatoes cut side up. 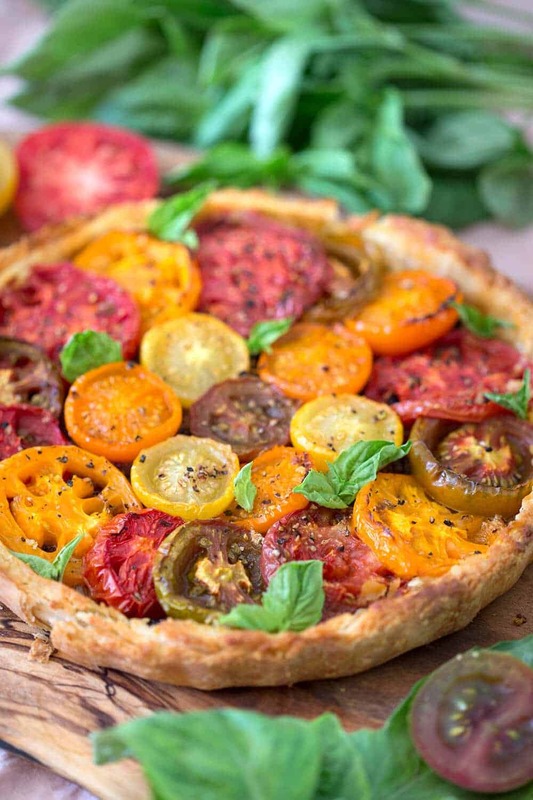 Bake for about 15 minutes or until crust is golden brown and tomatoes have softened. If you'd like to add some more flavors use the spread from my spiral vegetable tart in place of the plain goat cheese I used here. Can I substitute a pie plate for the tart pan? Mine isn’t quite as pretty as yours but I’m pretty excited to taste it. I used frozen puff pastry in an effort to save some time.